Once again another “oh-dark-thirty” wake up and prepare for whatever the day could provide us. I grabbed my muesli bar & piece of fruit “first breakfast” before we all headed over to the briefing room to see what the weather held for us today. Like yesterday, it looked like we’d be tight for winds but there was a good chance for a successful morning flight. Filing out of the briefing room, some folks went to grab a bit more food while the rest of us coordinated our crew and ensured our equipment was ready to go. 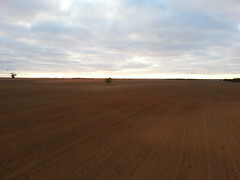 Not long after it’s 7am and the light is starting to show on the horizon as we arrive at Werrimull Oval to get set up. This time my set up & take-off were a lot better (not quite as rusty :) ) and we were in the air with everyone else. Climbing out over the town, we had a great view of everyone else in front of us as we rose up into the fast air, gaining on those down low ahead of us. In addition to my instructor Paul, we also had his nephew James on board who was getting some of his first instruction on flying balloons. Not long after take-off, I handed over to James who flew us under Paul’s guidance for most of the time we were in the air. As predicted by the pi-ball we put up earlier (a small helium balloon that lets us monitor winds in the bottom 1,000′ – 2,000′), we found slower, more Westerly winds close to the surface and faster, more Sou-Westerly winds aloft that curved around to almost Southerly by about 2,000′. 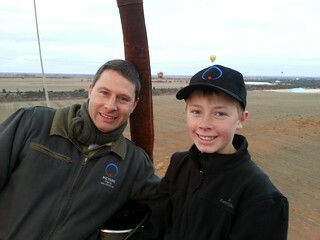 After some time in the air, James handed over to me and I started to get ready for the landing. The wind near the ground had sped up and I botched my first attempt at landing, aborting with heat & going back up to try again further down wind. Part of the problem was the hand-over had been done with very little time for me to get back into the feel of the balloon & the conditions. If I had been a more experienced pilot, it wouldn’t have been an issue, but as a student, I was still getting the hang of it. After breakfast & then relaxing plus doing some “day job” work for a few hours, we went to the afternoon briefing and all indications were that it would be rather windy and not likely to allow a flight to proceed. 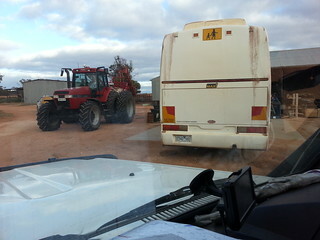 People were still going to the nominated launch field to check it out so we tagged along, driving past a farmer’s gear (including a rather large tractor :) ) to get to a huge open field of typical Mildura dirt. There we found everyone hanging around & watching Angus inflate his balloon in the winds. 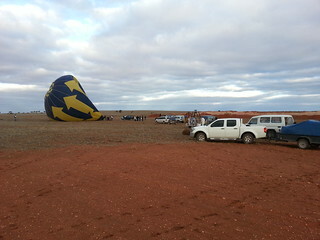 Everyone else had decided to stay on the ground but Angus thought he could make something of it, so with the help of some crew and a few guys on board the basket, he braved the winds & his balloon rolling about as it inflated. Sure enough, he made it work and got it into the air, winding up having a fun flight with a reasonably slow landing. Go figure. The rest of us headed to the pub for a drink then back to the Lake for dinner and bed. 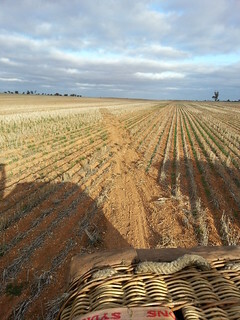 This entry was posted in balloons, Flight Notes, flying, Learning to Fly and tagged "drag landing", Angus, balloons, cancel, farmer, field, flight, Lake Cullulleraine, Mildura, TheLake12, wind. Bookmark the permalink.